So here is where we are at in the build... the fuselage dead-ends at the F22 bulkhead and is in a desperate need of a nose! The original plans has you build two panels (the NG30 panels) and is capped off with a nose bulkhead (the NG31 bulkhead of pg 13-6 in the plans). The extended round nose version is a bit more complex in that it adds an additional nose bulkhead and two more baby NG30's. This also allows for a roomier battery and storage compartment. Here I am showing the original NG30 (outlined in orange) superimposed with the taller modified NG30. After making the modified NG30 panels, they are bonded to the F22 bulkhead. The bulkhead that gets attached to the front of the NG30 panels is called the F1-3 bulkhead (since it is slightly inclined, it is located between fuselage stations 1 through 3 - hence the name F1-3). Small NG30's are then put in front of the F1-3 bulkhead (in line with the NG30's) - these are called BC1. The second nose bulkhead (the F-7.75) then goes in front of the BC1 panels. Notice it is called negative 7.75 since it is located 7.75" forward of the datum. Ary, great job, but where can I get a copy of the plans for the long nose, any recommendations .. I was looking at the construction pics of the nose in a later post and I was wondering if there is more or less legroom in your redesigned nose. There appears to be a lot more space above the pilot's feet but the larger bulkhead looks like it is slightly further back than in the original plans. I was also curious to know if you were going to fit adjustable pedals like those found in many gliders? Excellent documentation as usual! Thanks again for the great blog and videos! Thanks Todd! If you look at the 9th picture down from the top (on this blog post), you can see the original nose superimposed onto the modified design. The bulkhead that caps off the NG30 panels is more or less at the same exact location (F.S. = 1). 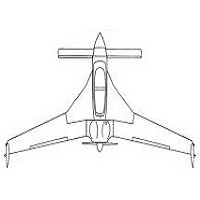 The modified nose has this bulkhead slanted back a few degrees – so that it starts at F.S. = 1 at the very bottom (just like the original nose), and ends up being at F.S. = 3 at the very top. When all is said and done, this just gives more compartment space (and a nicer looking nose – in my opinion). I’m 6 feet tall and my heels extend about an inch or two forward of the F22 bulkhead when I extend my legs – so the nose extension isn’t about getting more leg room – it’s more about the external aesthetics (the extra baggage compartment is a bonus). Funny you mention the adjustable rudder pedals – I’ve been working on them for the past week or two. I’ll be posting details about them in a few days… stay tuned! That looks outstanding ! Would you happen to have a source for your modified NG30 templates ? Thanks Randy! I mix and matched existing plans and came up with my own. I posted my templates under the 'documents' section of this blog - under 'Extended round nose mod'. Let me know if you have any trouble viewing them. Thanks so much for the great documentation you are doing on your Long. I am getting ready to start my extended nose on my long EZ. I thought I would do the canopy frame first, followed by the canard frame and then the nose. My plan is to leave the foam high and draft a smooth curve from the front of the canopy to the tip of the nose. However, I do want to frame the bottom and the lower half of sides so I can get the strength for the NG 30's and nose wheel. I'm debating using left over wing blue foam or the soft urethane for shaping those nose panels. I like the firmer blue foam. What are you using? Thank you for the positive comments! Funny you mention the canopy - I'm starting my canopy work right now for the same reason - to make sure the contour blends well from the canopy all the way down to the tip of the nose. And yes - I'm planning on using the dark blue foam for everything - the only time I use that flimsy urethane foam is when I need a small filler piece. Best of luck with your build - let me know how it goes! I am debating shorting the canopy frame at the front. A lot of them do it. I like the NACA air vent though. I think you can shorten and still leave enough room for the vent. Have you figured out what you are doing there yet? Yup, I'll be shortening the canopy front as well and add a seperate lid to access the avionics compartment. To help stiffen things up, I'll be adding a layer of carbon fiber to the canopy frame. As for the NACA vent, I personally don't like it and was thinking about getting rid of it. I asked other LE owners if it is used as just a vent for the pilot or if it serves as a defroster to keep the bubble from fogging up. I've gotten mixed answers. My current plan is to not have the NACA vent and install eyelid vents on the sides of the fuselage. If the bubble fogs up, I'll find a way to deflect air up towards the bubble canopy and circulate air to keep it from fogging. I have heard that one of the keys to getting good airflow through the cabin is having an "exit" air vent in the rear. I don't think many do it, but I am planning to include one. I believe this will help draw the air up the inside of the canopy and help with the defrost issue. I think I am going to stick with the NACA vent partially because of this. Very nice catia skill you have there! What functions should be used to create a fuselage of the long ez? Should I loft with sections provided in the plan? I'm currently using rhino but I am having a lot of difficulty drawing aircraft in 3d nontheless. Thanks Sangwa! Normally when designing or CADing most airplanes, you start off with modeling the bulkheads first. Then use a spline to connect the bulkhead corners. Use the splines to create the fuselage by creating panels between the bulkheads and splines. I hope this gives you a way to start. Let me know if you need further details.